Billy Talent is a Canadian punk rock band from Mississauga, Ontario. They formed in 1993 with Benjamin Kowalewicz as the lead vocalist, Ian D'Sa on guitar, bassist Jon Gallant and drummer Aaron Solowoniuk. There have been no lineup changes, although Aaron is currently taking a hiatus from the band due to an MS relapse, Jordan Hastings from Alexisonfire, Cunter and Say Yes is currently filling in for him. In the 24 years since their inception, Billy Talent sold well over one million albums in Canada alone and nearly 3 million albums internationally. BILLY TALENT T-Shirts which we offer at Plain-t-shirts.co.uk forms part of our movie, games and music official merchandise range. 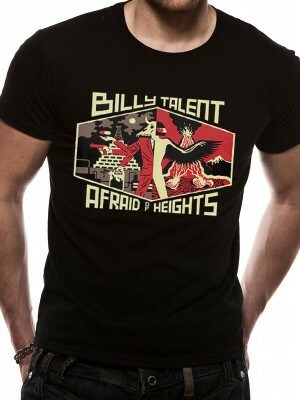 BILLY TALENT range we offer fast delivery all over UK/EU BILLY TALENT - AFRAID OF HEIGHTS (UNISEX) which we offer which .. The band existed for almost a decade before mainstream success. The members met and played in Our Lady of Mount Carmel Secondary School under the name Pezz and remained underground in Toronto's indie music scene until 2001. The band renamed itself Billy Talent after running into legal trouble with the old name. It was then that Kowalewicz's connection with an employee of Warner Music Canada's A&R department landed the band a record deal and launched them into mainstream success. Since then, Billy Talent has made three multi-platinum records in Canada, and continues to expand their success overseas, this included touring for 20 months supporting their second album. They released their third album, entitled Billy Talent III, on July 14, 2009, and their fourth album, entitled Dead Silence, on September 4, 2012. Dead Silence was followed up by a full UK tour over the course of October and November 2012. To commemorate the longevity since the release of their first studio album, the band has released a greatest hits album entitled Hits on November 4, 2014. The band regrouped and began to prepare material for its fifth studio album. Just prior to entering the studio, drummer Aaron Solowoniuk made the difficult decision to sit out the recording sessions while he continued his longstanding battle with multiple sclerosis. Fellow Canadian Jordan Hastings quickly recruited to play as Solowoniuk's studio stand-in, and in early 2016 the group completed work on Afraid of Heights, which was released that July.